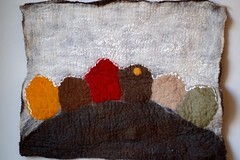 Lately I have been working in large pieces of felt. This one here is a wall hanging depicting a little colorful neighborhood. It's done entirely in soft merino wool with the wavy roofs and sky done in tencel which is a shiny fiber (derivate of wood pulp). When the light hits it, it twinkles... very pretty. Casitas means "little houses" in my mother language, Spanish. It has not been prepared yet for hanging. Without a wood strip on the back it means that it can be framed, transformed into a pillow, a table runner...and have free shipping! Casitas wallhanging: 90euros, free shipping.